The Federal Republic of Germany is located in the heart of Europe, bordered by Poland and the Czech Republic to the east, by Austria and Switzerland to the south, by France, Luxembourg, Belgium and the Netherlands to the west, and by Denmark to the north. Occupying an area of 137,847 square miles, Germany has northern coastlines along the Baltic Sea and North Sea. The fifth largest country in Europe, Germany is home to a population of more than 82 million. The nation's official language is German, and its currency is the Euro. To print this map of Germany, click on the map. After map loads, press Ctrl+P. Germany comprises three geographical regions: the north German plain, the central highlands, and the south central Alps. The northern plain is watered by the Elbe, Weser, and Oder Rivers; it includes the industrial centers of Hamburg, Bremen, Hanover, and Kiel. The capital city of Berlin lies in the east, as do the former East German cities of Leipzig, Dresden, and Magdeburg. Germany's northwest includes the industrialized cities of Cologne, Essen, and Dusseldorf. The cities of Frankfurt, Munich, Stuttgart, and Nuremberg, as well as the Harz Mountains, comprise the central highlands. 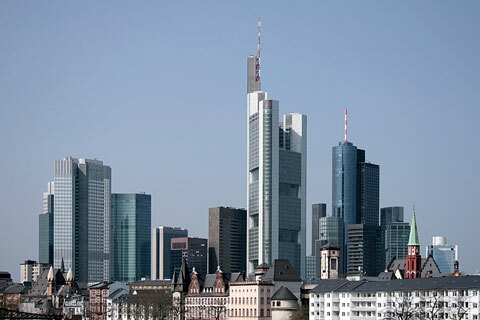 Frankfurt, a cosmopolitan city situated along the Main river in western Germany, is an important business center and boasts a spectacular skyline. Munich, a popular tourist destination in southern Germany, mingles urban sophistication and haute cuisine with Bavarian folk traditions like Lederhosen and Black Forest cake. 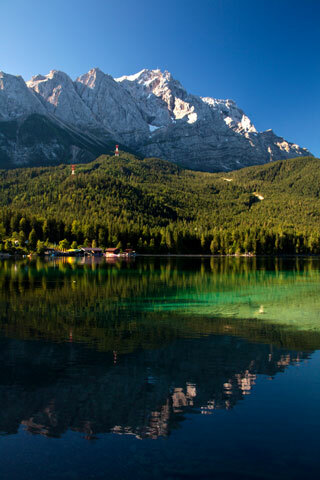 Southern Germany borders Switzerland and lays claim to the impressive Bavarian Alps. The famous Black Forest, one of Germany's greatest attractions, is also located in the south. Berlin, which is also Germany's largest city, is located along the banks of the River Spree. At the end of World War II, the virtually destroyed Berlin was divided into four sections: British, French, U.S., and Soviet. When East Germany was established, the Soviet sector of Berlin became East Berlin, and the rest was West Berlin. The famous Berlin Wall dividing the city was erected in 1961, where it remained until East and West Germany reunited. Today, parts of the Berlin Wall remain as a monument. Germany features picturesque small towns, elegant cities with a wealth of art museums and culture, and castles along the Rhine River. In south central Germany, the traveler can find serene farmland, stately forests, and beautiful mountainous landscapes. Germany's attractions range from the Alps and quaint architecture to historic castles and authentic German food. 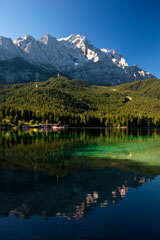 Germany's highest point is Zugspitze at 9,721 feet (2,963 meters). German Tourist Board - Discover Germany on your trip through various regions, and enjoy everything from the exciting hustle and bustle of the large cities to the cultural wonders. Encounter a very special part of Europe! CIA - The World Factbook - Germany - Government almanac for Germany offering statistics, geography, and maps. Wikipedia - Germany - Free online encyclopedia offers information about German history and the geography and regions of Germany. Germany News - News headlines and news article links about current events in the nation of Germany. Map of France - French maps. Map of Greece - Greek maps. Map of Italy - Italian maps. Map of Russia - Russian maps. Map-of-Germany.org. All rights reserved. About us.